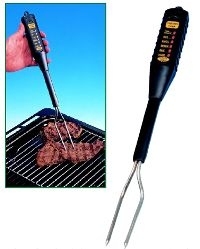 The BBQ Meat Fork is the ideal why to guarantee perfectly cooked meat on the BBQ. The thermometer display includes six LED lights to indicate how well the chosen meat is cooked. To regulate if your BBQ meat is suitable to eat, simply insert the fork shaped probes into the meat and wait until a temperature is taken.